Well, we finally get the whole story regarding Nora and Charles Montgomery. Kinda. I know there is more to the story, but we get a fuller picture of what a f*cked up family they were/are. 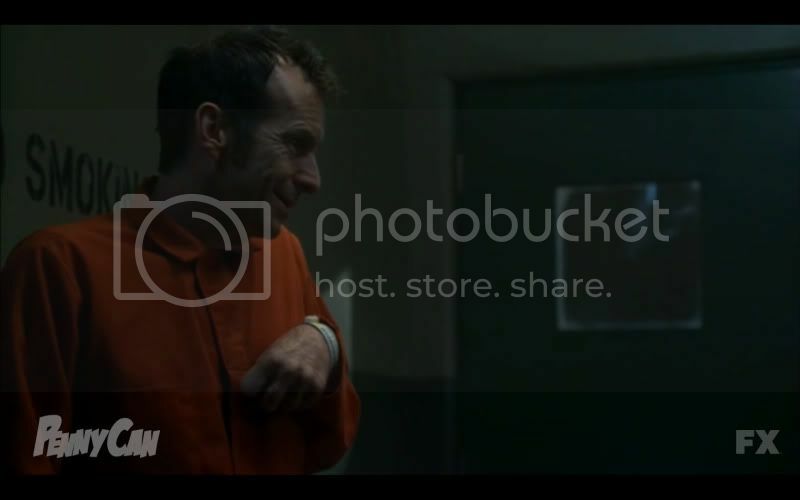 We also get to see exactly what the connection Larry (Denis O'Hare) has with Constance (Jessica Lange) as well as finding out that he wasn't the arsonist he claimed to be. And speaking of Jessica Lange. Just...wow. The entire season she has rocked her role and this episode in particular will get her an Emmy nomination. If it doesn't, I will personally drive up to LA with an 18 count carton of eggs and go to town on their offices. She definitely deserves not only a nom, but should be crowned for what she is bringing to the role. Why this series is not on the Nickelodeon channel is a mystery to me. ...willingly being complicit in having her own Mother institutionalize because she would rather bang a ghost instead of backing up her mother and what they saw out in the car and what she truly knows about the inhabitants of the house. Bad things are coming and I'm sure she will get what's coming her way for that. 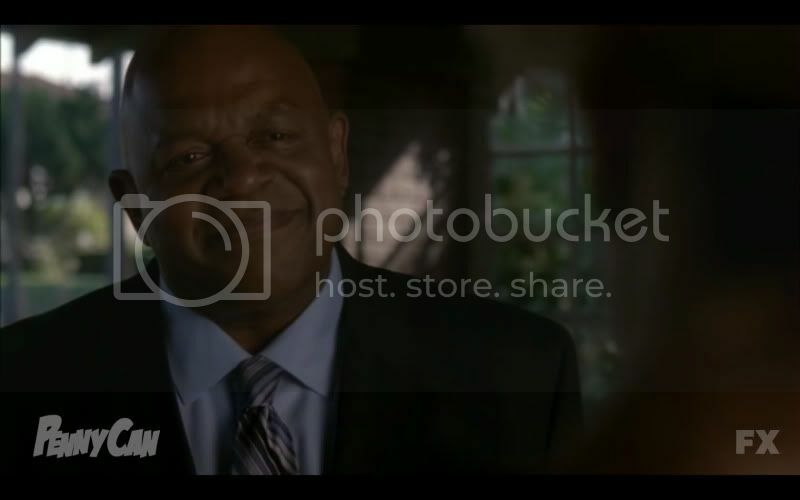 As for who was in the Rubber Suit, it was no surprise to me that it was Tate. I suspected it was him all along. Hayden scenes were really good and if the story-line holds form, she will be around for a long time. So I have missed the last 2 episodes. I think my On Demand waits a few days before posting. I know ep 8 is available and plan to watch soon. I knew watching it the other night on regular programming would have messed me up. Well get to it Son!! It's pretty damn good. This one was all about the women of American Horror Story and it phuckin' rocked! The story centers around the disappearance of a young Woman (Mena Suvari) looking to make it big in Hollywood and become famous. Only she becomes infamous as it turns out she is none other than Elizabeth Short, better known to the world as The Black Dahlia, the victim of a brutally horrendous murder back in 1947. When her body is discovered and the camera pans in for a close up, fans of Nip/Tuck are bound to make the comparisons to The Carver and it's victims. I can't be the only one that sees the similarities of the two. I'm sure this is a winking nod from Ryan Murphy. I'm really enjoying the story they are giving us with the Ghost of Murder House. I'm actually digging their stories more than I am of those that are alive at the moment. Really cool to see that even though the characters that meet their untimely demise on the show, it doesn't mean the end for the actors and actresses that portray them. Caught Rubber Man last week. Pretty damn intense. Missed this weeks showing because I missed the previous weeks showing. I was NOT expecting Violet to be one of the Ghost in the house. When the Truant Officer (Gregory Sporleder) came by and said that she had skipped school for the past 16 days, it went right over my head. 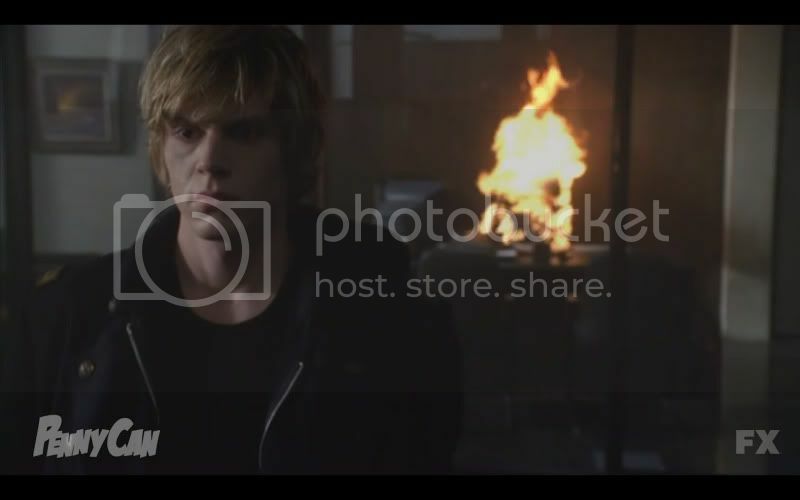 But then when Tate shows Violet what was in the basement, I was like "whoa". With the revelation of Violet and Vivien eventually finds out about her fate, she will have no choice but to keep and stay in the house if she wants to still communicate with her. We also get to see how and who turned Larry Harvey (Denis O'Hare) into an overdone Pop Tart. So many of the loose ends are coming together now. We aren't even done with Season 1 and I'm already looking forward to Season 2. In other brief news, the setting for numerous nightmarish events on the horror series is on the market for a cool $4.5 million by real estate agent Joe Babajian. (Let's all chip in and buy it together!) The six-bedroom, five-bath abode covers 10,440 sq. feet and rests on a lot that is nearly 30,000 sq. ft. Located at 1120 Westchester Place in Los Angeles, the Alfred F. Rosenheim mansion is described as an "irreplaceable masterpiece comprised of a 3-story main house plus a grand ballroom currently used as a recording studio." They add, "This residence evokes the quality and grandeur of a bygone era." ...Let's all chip in and buy it together! Only if Alexandra Breckenridge and Kate Mara are included with the purchase price. Ya.... hold your breath for that to happen.